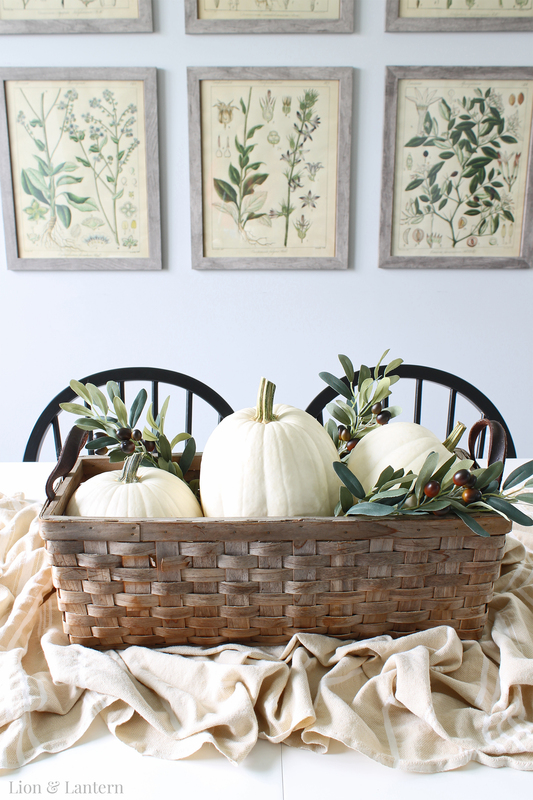 Pumpkins, baskets, and faux greenery bring the warmth of harvest time to a neutral farmhouse dining room. Hello dear friends! I hope you have all had a bright week; happy Friday! 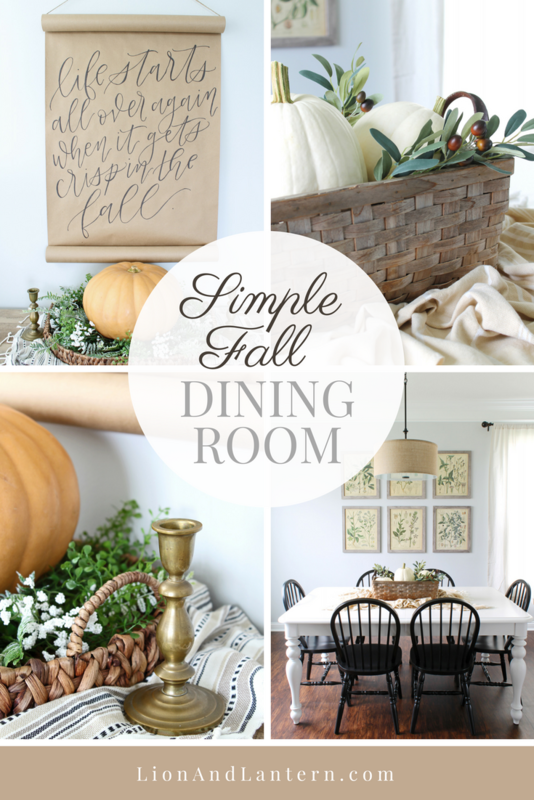 Our dining room has received fall refresh, so I decided to snap a few photos to share with you all. 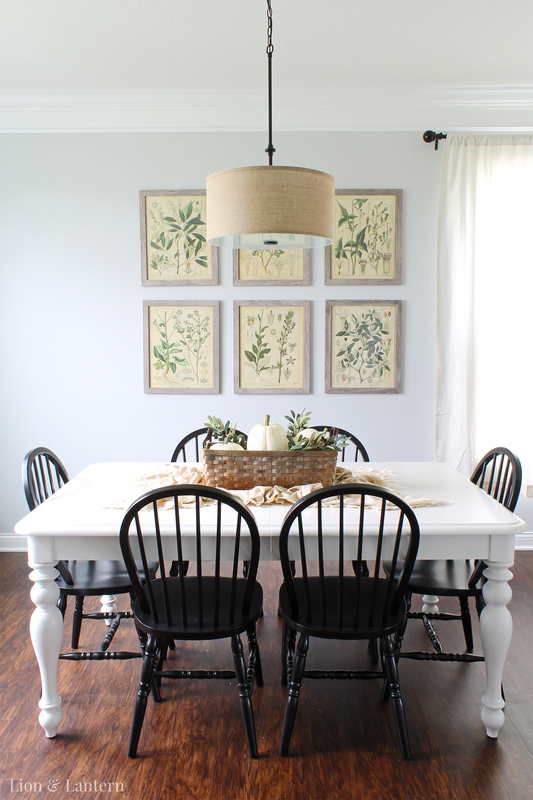 To see the “before,” you can explore our coastal-inspired summer dining room here! 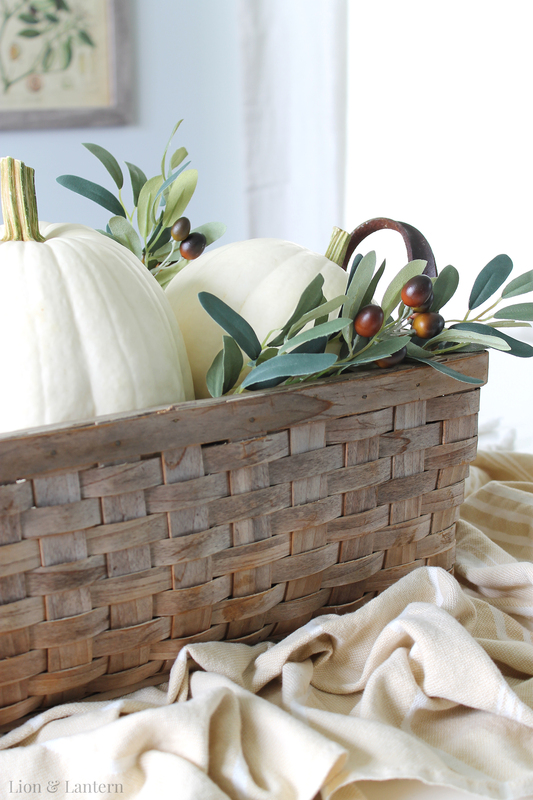 In order to cozy up this space for autumn, I swapped out my vase, hydrangeas, and bottles for this vintage basket I found at a local antique store. In fact, it was my first experience “haggling” (thanks to the sweet shop owner who basically offered me a discount). 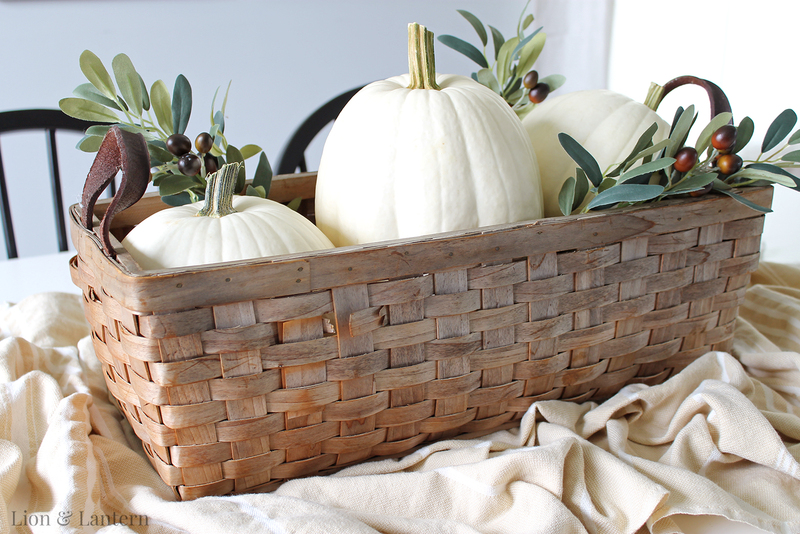 The basket’s weathered look gives the impression that it spent many days soaking up the sun’s rays. I love the rustic warmth it brings to our space! Also, notice the leather handles! They add interest to an already pretty piece. 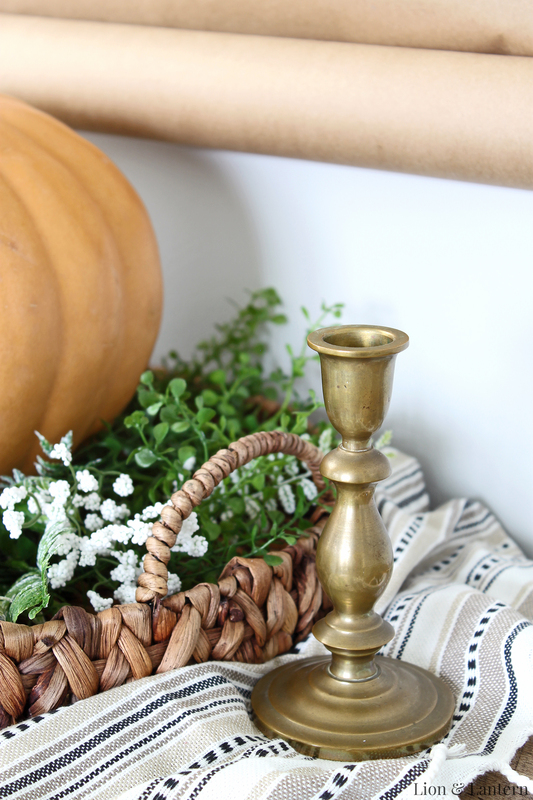 You have probably noticed this trio of white pumpkins making its way around our home. I first used them in our entryway, and then styled them in our living room. For now, they are cozied up in my new basket, but who knows, they will probably make another move soon! 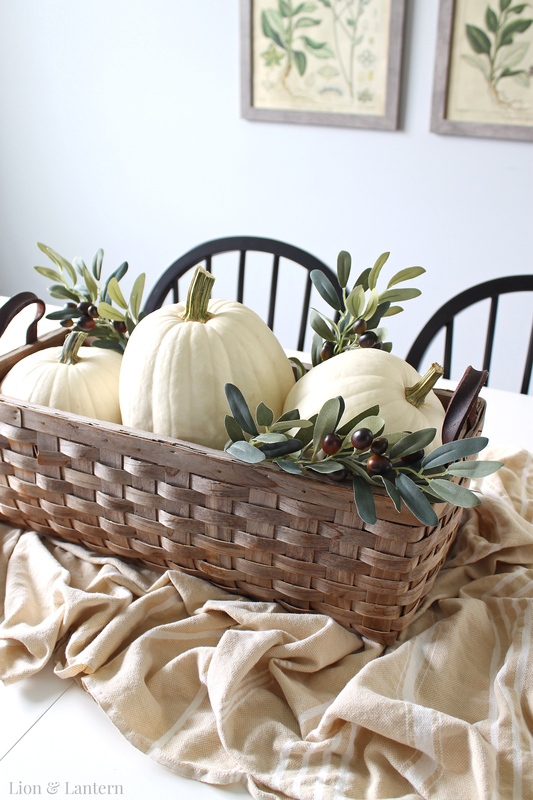 To fill out the basket, I added a few faux olive branches. I love the pop of color from the olives! 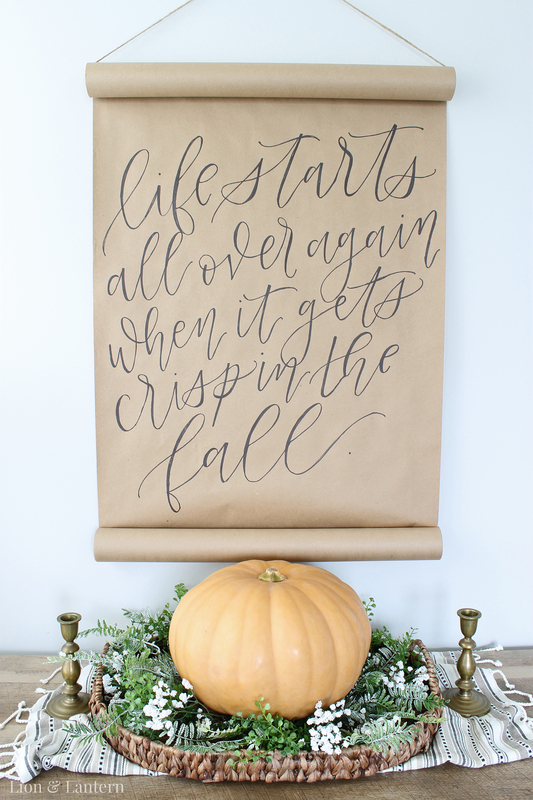 I already shared this little space in my DIY Calligraphy Scroll tutorial, but thought I would give an update since as usual, my decor is always changing 😉 This bulbous orange pumpkin is real, if you can believe it! 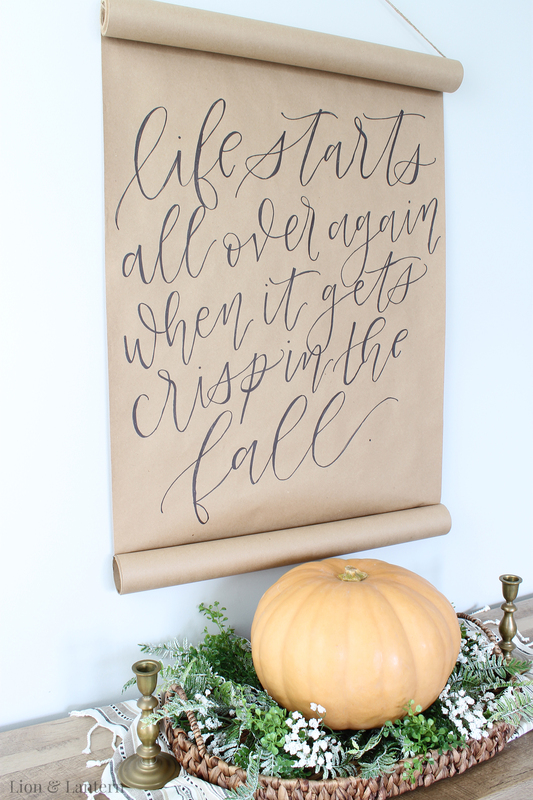 It seems to have tumbled right out of a fairy tale, and I love the whimsy it adds to our fall dining room. These brass candlesticks were another recent Goodwill find. I mentioned my new love of thrifting a few weeks ago, and I’ve been at it again! I just cannot get over the treasures you can find for such a reasonable price—about four dollars each, in this case. The brass provides a wonderful contrast to the striped tea towel, basket, and greenery. I may look for some ivory candles to add, but for now, I’m enjoying the candlesticks on their own. 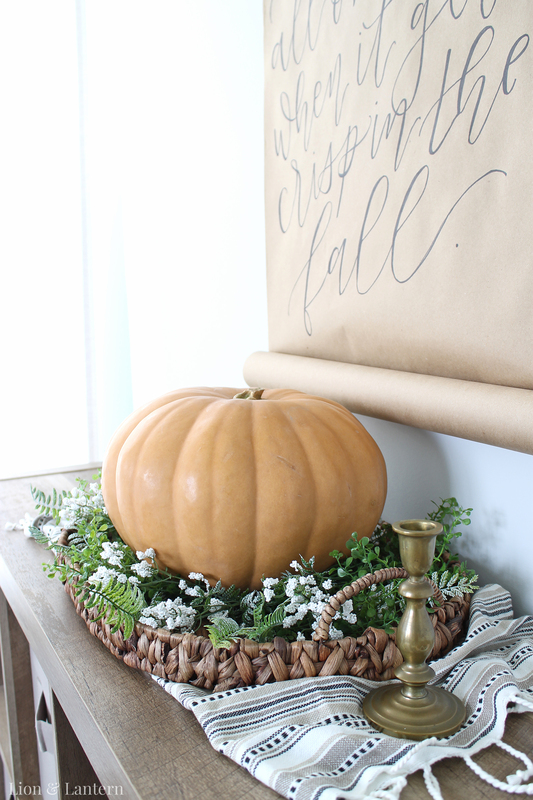 And there you have it, our fall dining room decor! I would love to see the simple updates you have made for the season! Or, let me know one of your favorite things about autumn 🙂 Thanks so much for stopping by dear friends! 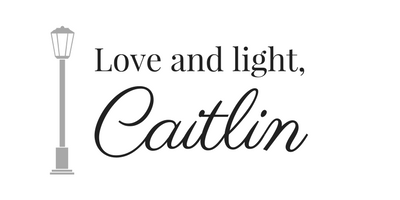 Caitlin I love the way you used towels and I think that’s a blanket on your dining room table. What a great idea! So beautiful. The scroll you did is stunning too. I have plans on learning how to write like this. I just need the time. Thanks for sharing! This is amazing. Everything is looking very beautiful. Thanks for sharing this post.